For other uses, see Tim Moore (disambiguation). Tim Moore (December 9, 1887 – December 13, 1958) was an American vaudevillian and comic actor of the first half of the 20th century. He gained his greatest recognition in the starring role of George "Kingfish" Stevens in the CBS TV's The Amos 'n' Andy Show. He proudly stated, "I've made it a point never to tell a joke on stage that I couldn't tell in front of my mother." Moore was born Harry Roscoe Moore in Rock Island, Illinois, one of 13 children of Harry and Cynthia Moore. His father was a night watchman at a brewery. Tim Moore dropped out of grammar school to work at odd jobs in town and even danced for pennies in the streets with his friend, Romeo Washburn. In 1898, Moore and Washburn went into vaudeville in an act called "Cora Miskel and Her Gold Dust Twins." It was booked by agents and travelled through the United States and even Great Britain. By 1904, the act had performed with the Barnum & Bailey Circus. As Moore and Washburn grew older, the act became less effective and Miss Miskel sent them back to their parents in Rock Island. Shortly after this, Moore joined the medicine show of "Doctor Mick" (Charles S. Mick), who sold a patented quack remedy called Pru-ri-ta. Doctor Mick travelled through the Midwestern states, with songs and dances provided by Moore and four Kickapoo Indians. The young man also worked in a carnival sideshow and gave guided tours as a "native" tour guide in Hawaii. Moore left Doctor Mick, first to become a stableboy and later a jockey. He also tried his hand as a boxer. He returned to performing about 1906, with a troupe of minstrels called "The Rabbit's Foot Company." By 1908, he was back in vaudeville and had met and married his first wife, Hester. They performed as a team, "The Moores - Tim & Hester", appearing in the United States and abroad. In 1910, the couple was part of an act called the Four Moores. They next performed together in "Georgia Sunflowers," a minstrel show that played the southern vaudeville circuit. The Moores drew glowing reviews, Hester for her singing and Tim for his comedy. By 1914, both Moores were co-stars of an act that was billed as Tim Moore and Tom Delaney & Co.. Tim played the tuba and Hester played drums as part of a band. Moore's own stock company was responsible for all aspects of it. The couple toured China, Japan, Australia, New Zealand, the Fiji Islands and Hawaii with a vaudeville troupe. The marriage ended in divorce in 1915, and in September, Moore married a vaudeville actress named Gertrude Brown. After more than a year on the road in vaudeville in the United States, the Hawaiian Islands, Australia and New Zealand, he returned to boxing as "Young Klondike", training in New Zealand. He fought there and in Australia, England, and Scotland. Before this, Moore fought as "Kid Klondike" in the US, with Jack Johnson and Sam Langford as some of his opponents. Moore also made his way into films by 1915, playing the part of an egotistical musician in His Inspiration. While Tim and Gertie were entertaining in New Zealand, a story in The Evening Post from May 28, 1917, went on to say, "Another "star" item will be that of Tim and Gertie Moore, who have earned a big reputation in America, and were booked for Fuller's direct from the well-known Orpheum circuit." Moore became well known for his one-man presentation of Uncle Tom's Cabin, where he would play the role of both Simon Legree and Uncle Tom, applying white chalk to half his face, and burnt cork to the other. Moore literally took his one man act into the street of San Jose, California, for the sale of War Stamps in 1918. Having made $141,000 with his fists, in 1921 Moore and his wife returned to performing full-time in vaudeville. He formed his Chicago Follies troupe and was a favorite on the Theater Owners Bookers Association vaudeville circuit during the "Roaring Twenties" period. In 1923, Moore and his wife co-starred with Sandy Burns, Fannetta Burns, Walter Long, and Bobby Smart in a silent film comedy, His Great Chance, directed by Ben Strasser (North State Film Corp.). The following year, the Moores toured vaudeville together in "Aces and Queens". Subsequently, he went on tour as one of the stars of producer Edward E. Daley's "black and white musical comedy sensation", Rarin' to Go, for three seasons on the Columbia Burlesque Wheel (1925, 1926 and 1927 editions). In June 1925, Tim Moore made his Broadway debut as the star of Lucky Sambo (based on "Aces and Queens'). However, the show closed after only a few performances. He was a success in burlesque in the mid 1920s with the hit show Rarin' to Go, followed by a return to vaudeville in 1927 with The Southland Revue. Moore wrote all of his own material and also did some writing for other performers; a Moore skit called, Not a Fit Night for Man nor Beast, was bought by W.C. Fields. He also did some writing for the radio show of the Two Black Crows comedy team. Moore was brought to New York to sign a writing contract but before this was done, Charles Mack of the team was killed in an auto accident, thus ending the act. Moore wrote sketches which became part of Lew Leslie's "Blackbirds" revues as well. In 1928, Moore took time off from his vaudeville bookings to try his luck once more on the Great White Way – Broadway. This time he met with enormous success as the star comedian of Lew Leslie's hit musical comedy revue, the Blackbirds of 1928. Moore's co-stars were singers Adelaide Hall and Aida Ward and renowned tap dancer Bill "Bojangles" Robinson. The hit musical scored high in Paris and London as well as on the road throughout the states. In 1931, Moore and his then vaudeville straight man, Andrew Tribble, performed one of their funniest routines in Oscar Micheaux's first talking picture, The Darktown Revue. After a disagreement with Lew Leslie, Moore starred in two unsuccessful Broadway revues for other producers, Fast and Furious (1931), and The Blackberries of 1932. In the former, Moore wrote some of the skits along with his friend and co-star Zora Neale Hurston. Moore and fellow comedian "Morton" (i.e., Mantan Moreland) left the show in April 1932, refusing to perform what were termed "dirty lines". Needing each other, he and Leslie patched up their differences and Moore resumed his position as star comedian in the Blackbirds revues of 1934, 1935, 1936, 1937, and 1939. Politics played a role in the demise of the 1936 edition of the Blackbirds, causing the London run to be shut down. At the time the troupe was booked in the United Kingdom, King Edward VIII had just abdicated the British throne for love of American Wallis Simpson. There was a wave of anti-Americanism, with women picketing performances of the Blackbirds, carrying signs disparaging American women. In this last of the Blackbirds (1939), the principal singing star was Lena Horne. Moore's last Broadway show was Harlem Cavalcade (1942), produced by Ed Sullivan and Noble Sissle. During the late 1930s and early 1940s, Moore was one of the top comedians headlining at the Apollo Theater in Harlem. He also performed on radio as a dramatic actor. In 1946, he starred as Bumpsie in the musical comedy film, Boy! What a Girl!. He made some appearances on Ed Sullivan's television show, Toast of the Town, and at the Apollo Theater; Moore then retired from show business. His wife Gertrude having died in 1934, Moore settled down with his third wife, Benzonia Davis Moore (1889–1956), in his home town of Rock Island, working the night shift at the Servus Rubber company, where boots and shoes were made. The couple was married in 1941 and initially made their home in Baltimore. In 1950, Moore was recommended by his old vaudeville friend, Flournoy Miller, for the role of George "Kingfish" Stevens, a role which was voiced on radio by white actor Freeman Gosden. He was called out of retirement by the Columbia Broadcasting System to star in a new television adaptation of Amos 'n' Andy. As the radio series had developed in prior years, the scheming but henpecked Kingfish had become the central focus of most of the plots. In the television version, Moore played the character more broadly, with louder and more forceful delivery and a distinctive Georgia drawl, exaggerated for comic effect. Moore's Kingfish dominated the calmer and soft-spoken "Amos 'n' Andy" characters. Early in his career, Moore had developed a "con-man" routine he used for many years while in vaudeville; re-working some aspects of his old act produced the television character Kingfish. Moore was very popular in the show and for the first time in his career became a national celebrity as well as the first African American to win stardom on television. When leaving a train in Albuquerque to buy some Native American pottery, the proprietor recognized him immediately, saying, "You, you Kingfish." This was the first time it happened in Moore's 52 years in show business. The show aired on prime-time TV from June 1951 to June 1953. Although quite popular, the series was eventually canceled due to complaints about ethnic stereotyping. Shortly after the television show left the air, there were plans to turn it into a vaudeville act in August 1953, with Moore, Williams, and Childress playing the same characters. It is not known if this was ever realized. After the series was canceled, it was shown in syndication until 1966 when increasing condemnation and pressure from the NAACP persuaded the show's owners (CBS, which still owns the copyrights) to withdraw it from further exhibition. It was resurrected in the early days of home videotape through public domain video dealers who had acquired episodes from collectors of used 16mm TV prints, although the copyright was never in the public domain. Illegally produced copies continue to be sold over the internet. The series itself would not be seen on a regular basis again until independent network Rejoice TV began re-airing episodes in 2012. Many of the episodes revolved around Moore's Kingfish character, supported by Ernestine Wade as his level-headed, emotionally strong wife Sapphire, and Amanda Randolph as his openly aggressive mother-in-law, without the participation of Amos or Andy. These Kingfish-only episodes were originally produced as a spinoff series, The Adventures of Kingfish, which made its debut on CBS on January 4, 1955 but lasted only a few episodes. When the Amos 'n' Andy half-hours went into syndication, the Adventures of Kingfish shows were added to the syndicated package under the Amos 'n' Andy series title. In 1956, Moore and his fellow cast mates Spencer Williams, Alvin Childress and Lillian Randolph with her choir, tried a tour of personal appearances as "The TV Stars of Amos 'n' Andy". The tour was halted by CBS, who viewed this as infringing on their exclusivity. Moore, and fellow cast members Williams, Childress and Lee, were able to perform for one night in 1957 in Windsor, Ontario, since legal action had not been taken against them in Canada. Moore married his last wife Vivian Cravens (1912–1988) eight months after Benzonia's death; they had been performing as a comedy team for some time before marrying in 1957. This marriage won him considerable publicity thanks to the "Roast Beef Scandal" of January 1958. Moore fired a gunshot in his home because of his "mooching in-laws" (stepson, stepdaughter, and her husband) when he found that the last of the New Year's roast beef had been eaten by them. Moore related, "These free-loaders have eaten everything in the house. My wife protects them and every time we talk about it, we get into an argument. The argument got a little loud and the next thing I knew, the big boy (his stepson Hubbard) jumped out of his chair. I ran upstairs and got out my old pistol. I didn't want to hit anybody." When the police arrived at the home, Moore, pistol still in his belt, told them, "I'm the old Kingfish, boys. I'm the one you want. I fired that shot. I didn't want to hit anyone, although I could have. Anyway, you should have seen the in-laws scatter when I fired that gun." The shot Moore fired hit the china cabinet; he was arrested and charged with assault with a deadly weapon, with police calling him the "funniest prisoner in police history." Moore was initially ordered held on $1,000 bond; the judge changed his mind and released Moore on his own recognizance. Tim and his wife reconciled, with Vivian's pleading for the charges to be dropped. Moore entered a not guilty plea before the case went to trial on March 24. He received a $100 fine and a year's probation as his sentence. When the story broke, local television personality and columnist Paul Coates invited Tim Moore to appear on his KTTV television show; Moore explained the situation in two guest appearances. Coates was promptly taken to task for Moore's appearances on his show by Stanley Robertson, a journalist for the African-American newspaper, the Los Angeles Sentinel, calling Moore "disgraceful" and labeling the two shows with Moore as "television's darkest hour." Coates replied to his critic in his January 29, 1958 Los Angeles Times column, calling Moore "a pretty wonderful, sincere man" and saying he strongly resented Robertson's attack on him. Because of the "Roast Beef Scandal," Moore was once more in demand and even received a testimonial tribute dinner from the Friars Club of Beverly Hills, and appearing on The Tonight Show with Jack Paar. The publicity also won him an extended performance engagement at the legendary Mocambo nightclub. Moore died at age 71 on December 13, 1958 of pulmonary tuberculosis in Los Angeles, four days after his birthday. There was no money to pay for his hospital care or for his funeral, Moore having received his final $65.00 residual payment from Amos 'n' Andy in January 1958. At one time, Moore had made $700 per week. After a large funeral at Mt. Sinai Baptist Church, he was buried at Rosedale Cemetery. At the funeral service, 10,000 fans and mourners passed his open coffin; attendance was star-studded and included Groucho Marx, Frank Sinatra, Dean Martin, Louis Armstrong, Tony Curtis, Sidney Poitier, Charlie Barnet, Noble Sissle, Erskine Hawkins, Louis Prima, Freeman F. Gosden, Charles Correll, Spencer Williams, Jr., Alvin Childress, Ernestine Wade, Amanda Randolph, Johnny Lee, Lillian Randolph, Sammy Davis, Jr., Eddie "Rochester" Anderson, Andy Razaf, Clarence Muse, Roy Glenn, Mantan Moreland, Pigmeat Markham, Willie Bryant, Earl Grant. Sammy Davis, Jr. later related that Frank Sinatra organized the effort to pay Tim Moore's funeral expenses. Moore's grave remained unmarked from the time of his burial until 1983; fellow comedians Redd Foxx and George Kirby raised funds for a headstone. There is now one marking the graves of Moore and his wife, Vivian, who died in 1988. Paying tribute to one of its favorite sons, the Rock Island Public Library held "Tim Moore Day" July 16, 2008. Moore's relatives in the area participated by sharing their memories of his life and work. In spite of his achievement as the first major African American television star, Moore is still not honored with a star on the Hollywood Walk of Fame. ^ a b c d e Johnson, Lillian (February 22, 1941). "Played Best Theatres Of The World". The Afro-American. Retrieved October 16, 2010. 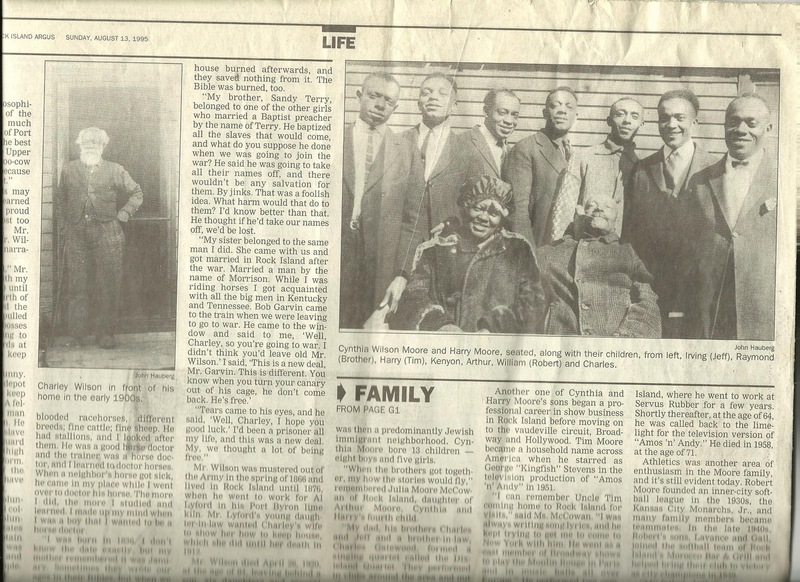 ^ "Photo of Tim Moore with his parents and six of his seven brothers". Rock Island Argus. August 13, 1995. Retrieved June 3, 2011. ^ a b c d e f g "Tim Moore Day". Quad City Times. June 16, 2008. p. 16. Retrieved September 22, 2017 – via Newspapers.com. ^ a b c d "Tim Moore". BlackPast.org. Retrieved October 21, 2010. ^ "Tim Moore". Black-face.com. Retrieved September 28, 2010. ^ "Tim Moore: The Gold Dust Twins". Yoda'sLair.com. Retrieved November 10, 2010. ^ a b c d e f "Tim Moore". Yoda'sLair.com. Retrieved November 10, 2010. ^ a b "TV Amos 'n' Andy Kingfish is Dead". Tri City Herald. December 15, 1958. Retrieved October 11, 2010. ^ Tyler, George (February 21, 1931). "Harlem Rambles-Down Memory Lane With Tim Moore". The Afro American. Retrieved October 16, 2010. ^ "The Rabbit Foot Company". The Freeman. August 1, 1908. Retrieved November 9, 2010. ^ "Tim and Hester Moore Presenting 'In Dark Town Suffragette'". The Freeman. November 8, 1913. Retrieved October 21, 2010. ^ "The Pekin, Richmond, VA". The Freeman. October 1, 1910. Retrieved October 21, 2010. ^ a b c Peterson, Bernard L., ed. (1997). The African American Theatre Directory, 1816-1960: A Comprehensive Guide to Early Black Theatre Organizations, Companies, Theatres, and Performing Groups. Greenwood Press. p. 336. ISBN 0-313-29537-9. Retrieved October 21, 2010. ^ "Tim and Hester Moore". The Freeman. December 21, 1912. Retrieved November 23, 2010. ^ "Tim Moore and Wife as a Heavy Box Office Attraction at the Monogram". The Freeman. January 27, 1912. Retrieved November 23, 2010. ^ "Dayton, Ohio". The Freeman. May 9, 1914. Retrieved November 9, 2010. ^ Wepman, Dennis. "Tim Moore". American National Biography. Retrieved March 15, 2017. ^ "50th Year for Lincoln Theater". Baltimore Afro American. September 12, 1959. Retrieved March 17, 2011. ^ a b "Two Comedians". The Afro American. June 23, 1934. Retrieved October 16, 2010. ^ Williams, Joe (February 8, 1951). "Joe Williams says". The Pittsburgh Press. Retrieved April 20, 2011. ^ "'His Inspiration'". The Evening Independent. January 18, 1915. Retrieved October 21, 2010. ^ "His Majesty's Theatre". The Evening Post. May 28, 1917. Retrieved November 10, 2010. ^ a b "More than the Kingfish, Actor Tim Moore". African American Registry. Retrieved November 10, 2010. ^ a b c d Wintz, Cary D.; Finkelman, Paul, eds. (2004). Encyclopedia of the Harlem Renaissance: Volume 2. Routledge. p. 1392. ISBN 1-57958-389-X. Retrieved November 28, 2010. ^ "The Jose". The Freeman. August 13, 1918. Retrieved November 23, 2010. ^ McCollum, Obie (May 21, 1927). "Says 'Dead' Chinese Actors Rise to Bow to Audiences". The Afro American. Retrieved October 21, 2010. ^ Why the Stars Go Broke. Ebony. July 1963. Retrieved March 8, 2011. ^ "Tim Moore's Chicago Follies Co". The Afro American. December 21, 1923. Retrieved October 21, 2010. ^ "What the Stage Stars Were Doing 10 Years Ago". The Afro American. February 27, 1932. Retrieved October 21, 2010. ^ "Rarin' To Go". The Toledo News-Bee. 6 September 1926. Retrieved 21 October 2010. ^ "This Week in the Theatres". The Afro American. July 14, 1928. Retrieved March 17, 2011. ^ "Tim Moore To Be 'Blackbird'". The Afro American. April 21, 1928. Retrieved November 23, 2010. ^ "Sees Aida Ward As Future 'Flo' Mills". The Afro American. May 26, 1928. Retrieved October 21, 2010. ^ Tyler, George (February 14, 1931). "Harlem Rambles". The Afro American. Retrieved February 16, 2010. ^ "3 Leading Comedians Neither Sing Nor Dance; But Are Hits". The Afro American. October 10, 1931. Retrieved October 16, 2010. ^ "1932: In Which Father Time Puts on The Worst Act Of His Career". The Afro American. December 24, 1932. Retrieved October 16, 2010. ^ "Many New Plays Slated To Run On Broadway". The Afro American. August 8, 1931. Retrieved October 16, 2010. ^ "Wouldn't Be Dirty, Comedians Quit Show". The Afro American. May 7, 1932. Retrieved October 21, 2010. ^ Matthews, Ralph (February 13, 1937). "Who Killed Mr. Leslie's Blackbirds?". The Afro American. Retrieved October 16, 2010. ^ "New Romantic Opera". The Glasgow Herald. March 19, 1937. Retrieved October 16, 2010. ^ "'Blackbirds' To Get Another Try". Washington Afro-American. February 11, 1939. Retrieved October 16, 2010. ^ Wilson, Cleon (May 5, 1942). "Cavalcade Scores On Broadway". The Afro American. Retrieved October 16, 2010. ^ a b c Clayton, Edward T. (October 1961). The Tragedy of Amos 'n' Andy. Ebony. Retrieved September 27, 2010. ^ "Eva Jessye In Radio Play". The Afro American. April 8, 1933. Retrieved October 16, 2010. ^ Bowen, Charles I. (April 22, 1933). "On The Air-Eva Jessye, Radio Actress". The Afro American. Retrieved November 23, 2010. ^ "Marva Forced Out of New Film By Infected Throat". The Afro American. September 28, 1946. Retrieved October 16, 2010. ^ "Amos 'n' Andy Look For Exit As They Plan New TV Show". Reading Eagle. June 17, 1951. Retrieved October 16, 2010. ^ "Amos And Andy Name Subs For Television Roles". St. Petersburg Times. June 18, 1951. Retrieved October 11, 2010. ^ "Radio's Veteran Comics Smash Hit on Television". Eugene Register-Guard. April 14, 1954. Retrieved March 12, 2011. ^ Lyons, Leonard (August 11, 1951). "The Lyons Den". St. Petersburg Times. Retrieved October 16, 2010. ^ "'Amos 'n' Andy' Set for Vaude". Baltimore Afro-American. August 4, 1953. Retrieved April 20, 2011. ^ New 'Kingfish' Series To Make TV Debut Jan. 4. Jet. January 6, 1955. Retrieved October 10, 2010. ^ Kantor, Michael; Maslon, Lawrence, eds. (2008). Make 'Em Laugh: The Funny Business of America. Twelve. p. 384. ISBN 978-0-446-50531-4. Retrieved March 17, 2011. ^ Gardiner, John (June 25, 1957). "The Theatre and its People". The Windsor Daily Star. Retrieved March 12, 2011. ^ "Amos 'n' Andy Show Figure To Wed Today". The Sun. June 6, 1957. p. 3. Retrieved November 10, 2010 – via Newspapers.com. ^ "Casino Features Chinese Dancer". The Pittsburgh Press. December 12, 1945. Retrieved October 16, 2010. ^ a b TV Kingfish and His Sapphire in Real-Life Domestic Brawl. Jet. January 16, 1958. Retrieved November 10, 2010. ^ a b c "The Daily Mirror". Los Angeles Times. January 29, 2008. Retrieved December 8, 2010. ^ Kingfish Dismissal Plea Denied, 2 Make Up. Jet. January 30, 1958. Retrieved November 10, 2010. ^ "Kingfish Arrested On Assault Charge". Associated Press. January 1958. Retrieved November 10, 2010. ^ Kingfish Pleads Not Guilty In Gun Fracas. Jet. February 27, 1958. Retrieved November 10, 2010. ^ Kingfish Fined $100 For Roast Beef Fracas. Jet. April 10, 1958. Retrieved November 10, 2010. ^ Words Of The Week. Jet. January 23, 1958. Retrieved October 10, 2010. ^ Critically Ill, Kingfish Tells Wife Of Fears, Disappointments. Jet. December 18, 1958. Retrieved October 10, 2010. ^ "Kingfish Succumbs". Baltimore Afro-American. December 16, 1958. Retrieved November 11, 2010. ^ 10,000 Mourners See TV's Kingfish Buried In style. Jet. January 8, 1959. Retrieved October 10, 2010. ^ Harry Moore, TV's Kingfish. Jet. December 25, 1958. Retrieved October 10, 2010. ^ Sinatra A Complex, Honest Guy, Says Sammy. Jet. March 12, 1959. Retrieved October 10, 2010. ^ Kingfish Discovery. Jet. August 15, 1983. Retrieved November 10, 2010. ^ "Tim and Vivian Moore Headstone". Find A Grave. Retrieved November 10, 2010. ^ "Widow of actor 'Kingfish' dies". Reno Gazette-Journal. January 14, 1988. p. 50. Retrieved September 22, 2017 – via Newspapers.com. Bogle, Donald. Blacks in American Films and Television: An Illustrated Encyclopedia. Simon and Schuster, 1988. Wikimedia Commons has media related to Tim Moore (comedian). Boy! What a Girl! at Internet Archive. This page was last edited on 26 November 2018, at 04:31 (UTC).